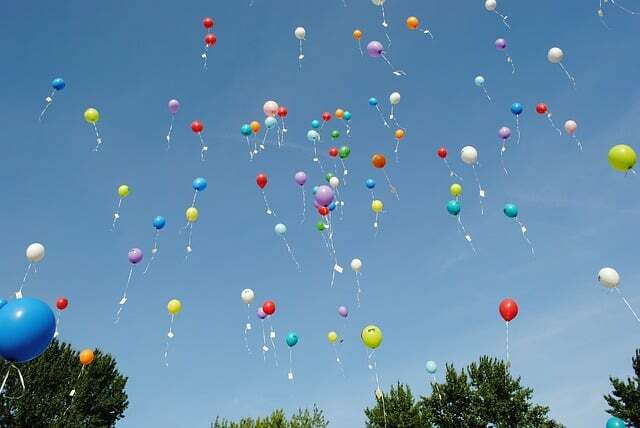 Balloon releases at funerals are becoming more popular as a visual expression of love. This growing trend seems like the appropriate metaphor for a loved one’s spirit as it ascends through the air. Also, releasing balloons at a funeral conjures up feelings of contentment and is a poignant way for individuals to say there final goodbye. Releases are commonly done towards the end of a funeral to symbolize the letting go of a loved one. Before releasing the balloon people may want to give it a kiss, say a prayer or write a personal sentiment on the balloon. When released into the air, each person will respond differently as a range of emotions cascade over their bodies. As the balloons slowly drift upward it leaves all involved at ease and provide each person with their own individual memory of their final emotional attachment with that person. At the Balloon Man we offer a discreet and sensitive service, which can be adapted to your needs. A member of our staff can be made available to hand out or release the balloons. At the Balloon Man our balloons are completely bio-degradable and instead of ribbon we use natural raffia ties as they are also fully bio-degradable.